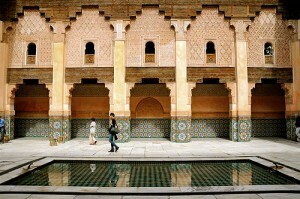 Morocco has the richest Islamic architectural heritage in North Africa. Key to this was the influence of Muslim Andalusia, as Muslims were expelled from Spain as a result of the Christian Reconquista led by King Ferdinand and Queen Isabella in 1492. This Andalusian style, which was a rich fusion of European and Arab creativity had a far greater architectural influence, than the Middle East. 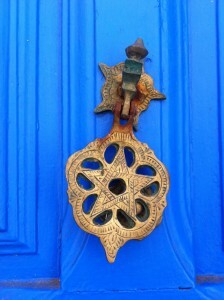 Morocco was at the centre of the Hispano-Moorish architectural movement for almost six centuries (11-17th Century). 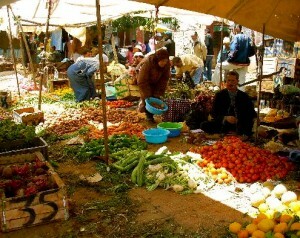 Algeria and Tunisia came under the Ottoman empire but Morocco maintained its independence and withstood the Ottomans. 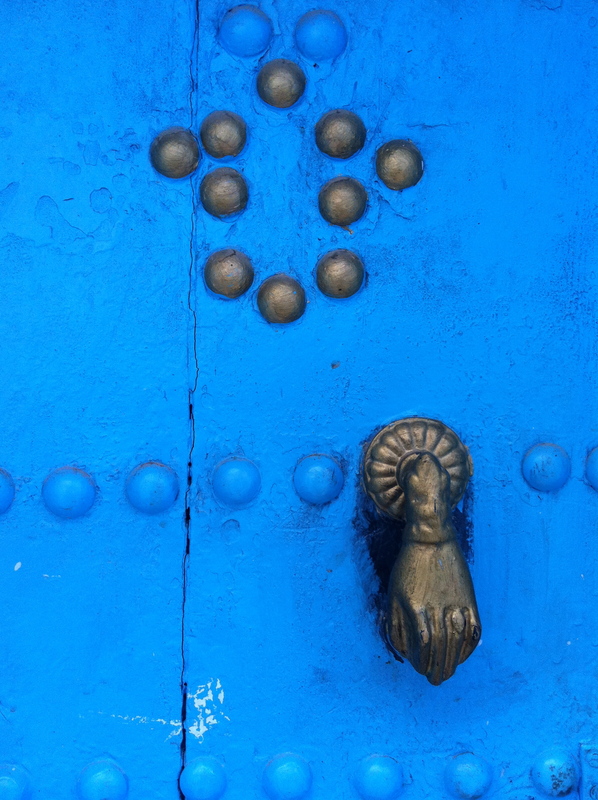 Morocco’s early Islamic architectural heritage was enriched by the Arab conquest in the seventh century and the indigenous Berber culture which continues to thrive today. Due to Islam’s forbidding of all human representation, most decorative art was based on geometric patterns, arabesques and floral motifs. 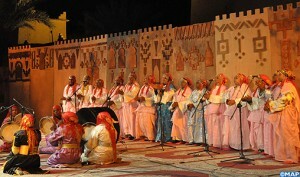 Cursive or Kufic script also features prominently. 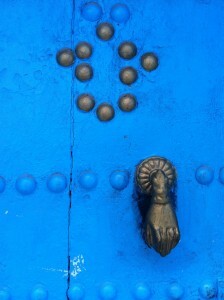 Such motifs can be found in stone, brick or wood, but Hispano-Moorish art particularly favored two materials. The first, stucco, was applied in plaster form to surfaces covered in nails and sculpted while still damp, often into stalactite forms. The second, zellij tiling on panels, is a Moroccan decorative feature. The basic layout of the mosque has not changed since the beginning. It always faces Mecca, the direction of which is shown by the mihrab, an alcove in the middle of the qibla wall. Next to it is a minbar , a platform or pulpit, made out of wood or marble, on which the spiritual leader stands to deliver his sermon. In Morocco, the minaret is a square-shaped tower, topped with a battlemented platform where the muezzin stands to call the faithful to prayer five times a day. A madrasah is a college of theology. The building’s specific function gave birth to an equally specific architectural style. An elaborately decorated door with awning, opened onto a narrow central courtyard surrounded by classrooms and a prayer room. The masters and students lived in cells on an upper gallery overlooking the central courtyard. 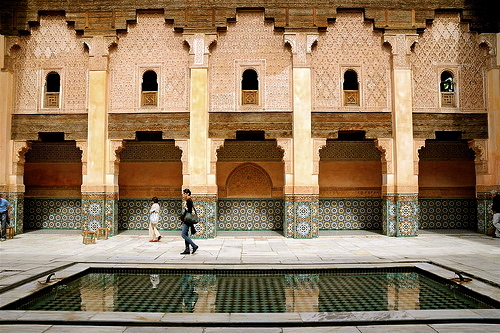 The courtyard contains the madrasah’s sophisticated decorative features: central fountain, zellij floors, intricately carved stucco fanlights, carved cedar wood corbels and cornices. The Ben Youssef Medersa in Marrakech was the largest theological college in North Africa. It was founded during the Merinid dynasty (14th century) by Sultan Abu al-Hassan and allied to the neighboring Ben Youssef Mosque. The building of the madrasah was re-constructed by the Saadian Sultan Abdallah al-Ghalib (1557–1574). A koubba, better known as a marabout, is a mausoleum built for pious Muslims who had achieved something approaching sainthood on their deaths. Their distinctive white domed roofs – koubba originally meant dome – and little cubic buildings are a familiar sight throughout the Moroccan countryside and they are the object of pilgrimages. Very little remains architecturally of the first two or three centuries of Islam in Morocco, of the 8-10 centuries. The excavations of the ancient city of Sijimassa and the former royal city of Aghmat near Marrakech by a team was led by Professor Ron Messier, from Vanderbilt University USA and Professor Abdallah Fili faculte des letters Universite d’El Jadida. They found that the mosques in both locations were extensive with a mobile minbar, which could be moved on rails. When these locations began to decline because of factors like loss of water and population change. Their buildings were dismantled to create new structures nearby in time honored Moroccan fashion and as communities changed buildings also changed their functions. The hammam at Aghmat became a pottery. 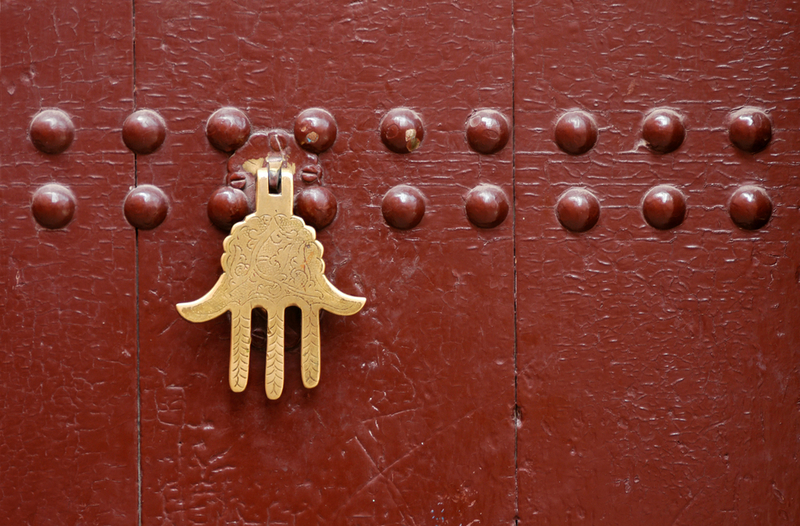 The two most important mosques of Fès, the Qarawiyin and the Andalusian Mosque were both founded in the mid 9th century, were the work of immigrants from Andalusia. Desert nomads, the Almoravids clearly had no architectural traditions and naturally enough adopted those of Andalusia, which they had just conquered; hence the term “Hispano-Moorish” given to this art symbolized by semicircular Moorish arches and a decorative style. The Almohads’ hatred of the Almoravids led them to destroy all Almoravid works, which were considered too frivolous; consequently, almost nothing remains of the Almoravid edifices in Morocco itself: exceptions being some parts of the Qarawiyin Mosque in Fès, extended in 1130 and the Koubba Ba’Adiyn rediscovered in 1950 in Marrakech. The Almohad dynasty was influenced by Andalusia, like the Almoravids and was responsible for one of the greatest artistic movements of Morocco’s history. The scale of design and the sobriety of the decoration, the handsome proportions and pure lines characterize Almohad architecture. The fortifications and Great mosque at Taza, together with the superb funereal mosque at Tin Mel, recently restored, date from this period. Almohad mosques have grand proportions and impressive minarets. A typical Almohad minaret is somewhat squat and square-shaped: its height is equal to five times its base, and it is constructed from freestone. The Kotoubia mosque in Marrakech was completed in the 1190’s during the reign of the Almohad Sultan Yusuf El Mansour. (1184 to 1199). Its minaret, which is 253 feet high, inspired the Giralda at Seville and the Hassan Tower at Rabat. This iconic minaret is the greatest testament to Almohad religious architecture. Moroccan square minarets continue to be built today and are unique to Morocco. The Merinids’ reign, up until the mid-14C, was one of the most fertile periods of Moroccan architecture. Ornamentation became more important, even in edifices such as fortifications. 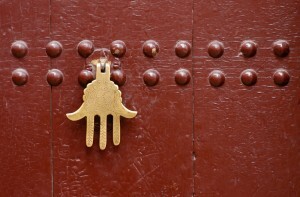 The main door of the wall around Chellah (Rabat) built in 1339 is a fine example. 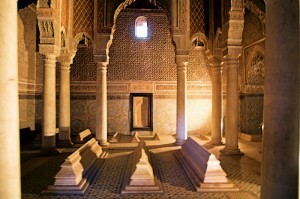 Abu el-Hassan and Abu Inan, the two main Merinid sultans and patrons of architecture built many mosques and madrasas. 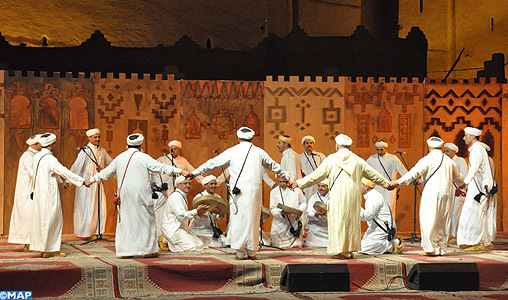 Merinid madrasahs include the Bou Inania, Attarine and Sahrij at Fès, Abu el-Hassan at Salé and Bou Inania at Meknès are among the best known. A continuing tradition of Hispano-Moorish art persisted under the Saadians and the Alawites (16th -present). In the 20th century, the last manifestation of Hispano-Moorish art to be built was the Hassan II mosque in Casablanca. 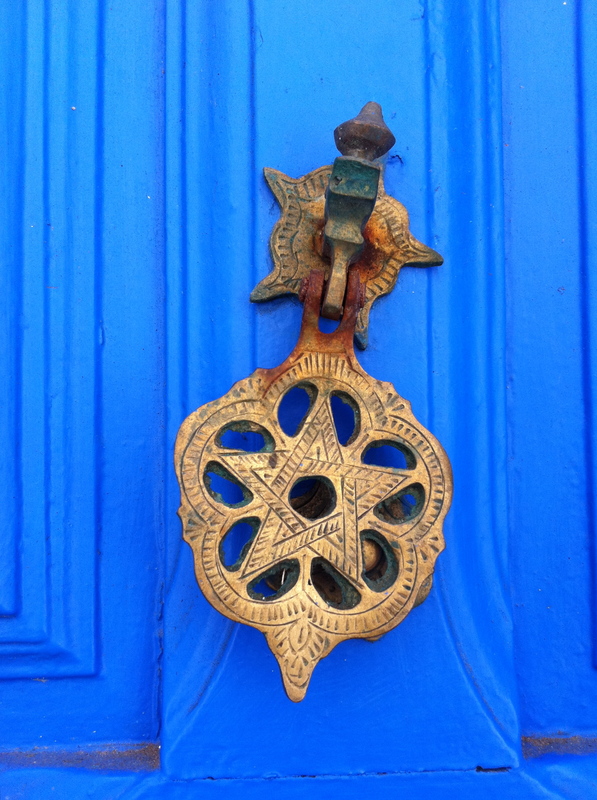 You are currently browsing the Travel-Exploration Blog blog archives for August, 2014.